The Basics of Profibus and ProfiNet, Revealed! Regularly I attended free one day seminars on Profibus & Profinet put on by the PI Organization. They have two different classes that they offer in cities all over the US and Canada. There are usually about 50-100 attendees and it is a great opportunity to network with local engineers from and around the area in a wide variety of industries. During breaks, multiple vendors of Profibus & ProfiNet related products were available to discuss applications and projects with the attendees and provide valuable resources for industrial network design. 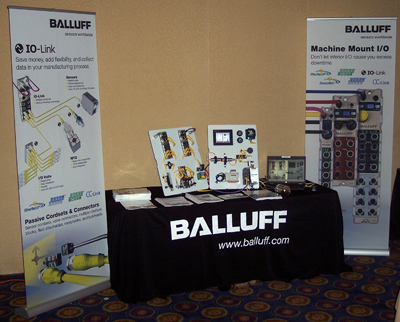 We (Balluff) are a sponsoring member of the seminars and I was attending to discuss IO-Link, Profinet and Profibus industrial network applications with potential and current customers. If you are unfamiliar with Profibus, ProfiNet or IO-Link I recommend you attend one of these seminars to learn about how it can help your machine design. I updated the text in this entry on 3/8/2011.